The Philippines' Gilas Pilipinas had rebounded back to win against the Japan last August 5 of FIBA ASIA 2013 Championship with a score of 90–71 wide margin in favor of the Gilas team. When you watch the full video replay highlights of Philippines vs Japan, this big win is a sign of big improvement since their first heartbreaking loss from Chinese Taipei. They really get passed from that loss that the Gilas team stays in focus in their up and coming game. The Philippines now 2-1 in group E behind Quatar and Chinese Taipei who is still undefeated with 3-0 record. 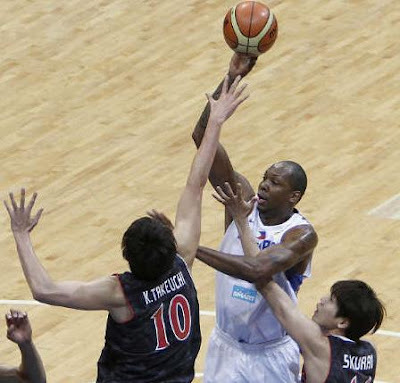 The Philippines defeated Japan in a dominant fashion starting from the 3rd quarter until the end of the game. Gary David finally shoots his first 3 points and a sign for him to play with confidence for the Gilas Pilipinas team. These were the highlight scores of the game below. Gilas wins against Japan, 90-71, goes up 2-1 in Group E.
Gilas leads 82-65 with 3:21 to go. Chot Reyes calls a timeout. Philippines 82-63 Japan 4mins to go in the 4th. Jimmy Alapag for three! The Philippines is up by 19, 82-63, w/3 mins to play in the 4th quarter. Norwood drains a jumper, and GilasPilipinas is now ahead by 23 big pts, 63-40! 4:51 to play in Q3. Philippines 17-14 Japan at the end of the 1st. Here's a comment from Chot Reyes in that game against Japan, "The reason for our bad starts was because we weren't ready to play defense from the opening tip,". "I started with a defensive line-up, with Pingris, Norwood and Jason Castro. It allowed us to get some stops, and our entire game is predicated on our ability to run off our stops." Coach Reyes added. With that win, Gilas Pilipinas has to face the big guys of Quatar at Mall of Asia Arena (MOA) tomorrow on August 6, 2013. If any of you wants to watch the video replay and highlights of the game between the Gilas Pilipinas vs Japan, here's the video replay highlights below for you to watch. Here's the video replay highlights of the game.